In this file you will receive a 8 page pdf file of the Move It Prove It card game for 8.EEA.3. The game is printed with 4 cards per page. There are 30 total game cards, a title card, and a directions cards. In this game students must match the cards in groups of 2 that make a set. 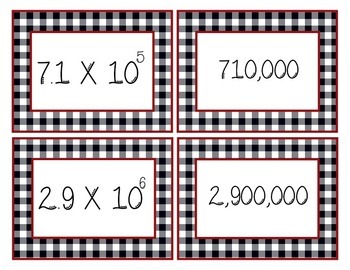 For example, the number 68,000,000 matches to 6.8 X 107. When done as an extension, have students put themselves in order from least to greatest with their partners. 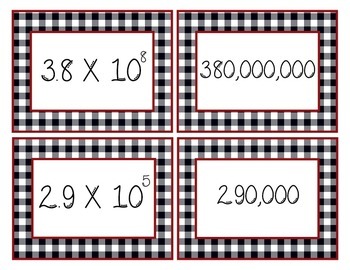 This is a great introduction to scientific notation! 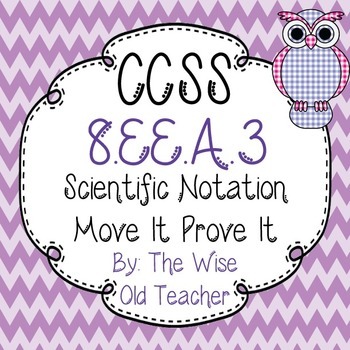 "Move It Prove It" is a great way to get your students up and 'moving' while 'proving' knowledge of a skill. This game should take no more than 5-10 minutes total and it will get the students a much needed movement break. The rules are simple. Remaining absolutely silent (they can only communicate by motioning and looking at each others' cards) they must find their partners and stand together. When signaled by the group, the teacher checks to make sure they group is correct. Upon approval, the students return to their seats, or if you wish to play again, instruct students to trade cards with another student and play again. 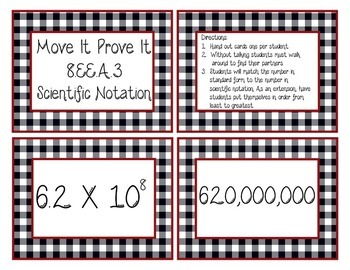 Check in my store for other Move It Prove It games to help practice the Common Core Standards!